Tweet: Muse could fill a "black hole"
Could be a 'revelation', eh, Michael?! Unless, of course, @MichaelEavis is an imposter. If, like half of the MusicRadar team, you made the error of not going to Glasto this year, keep an eye on our Twitter feed (the #Glasto posts) for updates and photos live from the festival. 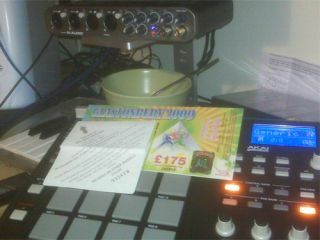 The ticket shot above was taken last night… unfortunately the Akai MPC didn't fit in the rucksack.